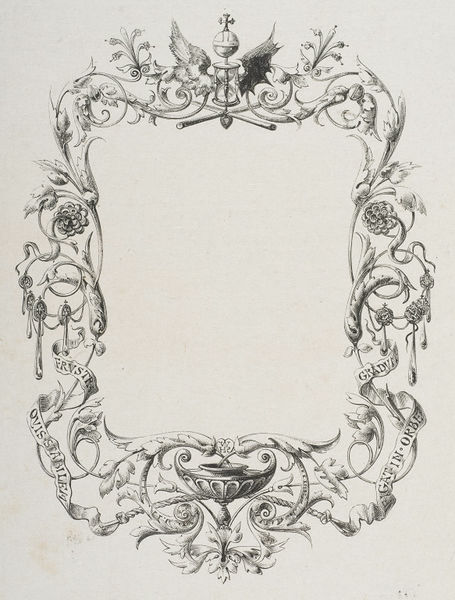 Border, in the top centre of which, is an hour glass, surmounted by an orb, flanked by a bird's and a bat's wing with acanthus leaves, tudor roses and orb like motifs forming the sides of the border. 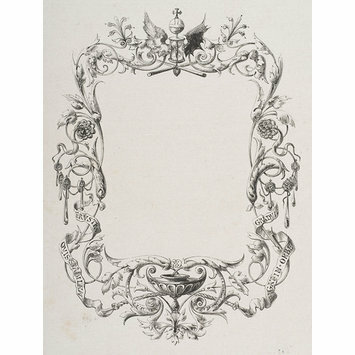 Proof of border framing book illustration E.877-1998 for 'Emblem IX' opposite 38 p. of 'Book The First. The Invocation' for the 1861 edition of 'Quarles' Emblems'. W. Harry Rogers drew on wood for this engraving to be made by a wood-engraver. Proofbook illustration to 'Quarles' Emblems', 1861, wood-engraving by W.Harry Rogers. Ball, Douglas 'Victorian Publishers' Bindings.' London: The Library Association, 1985. 90 p. and 155 p.
The date '1860' on the proof for the book illustration E.867-1998 and '1859' on the border E.890-1998 suggests that the proofs were drawn on the wood-engraving block in 1859 and 1860 for the 1861 edition of 'Quarles' Emblems'.